Hello again, this review is about Perky-Pet Fly Thru Metal Bird Feeder. I have chosen to review this one because its different than your usual bird feeder, its all made of metal, all mesh design, this feeder is full of holes and offers lots of access to the birds. It has open access from the sides, and tunnels to allow lots of birds to feed at once, and nice design that can complement the backyard. It is made with clinging design, that is done to welcome small birds, like Cardinals and Chickadees, and deter larger birds that can be bully. The mesh is a little wide, so you must be careful that you don’t put small size seed so they don’t spill out, this is limiting on what seed you can use. The metal construction is resistant to damage by chewing, if squirrels come by, but it is not going to stop access to the seed, as it has open design. But on the other hand, this open design is good for if the seed gets water, as it can dry easily, as it has good air circulation. The capacity of the fly through bird feeder is 2 pounds, but again, smaller type seed will spill, so larger seed is your safer option. Finches, sparrows, wrens, titmice, nuthatches and chickadees will all readily visit this feeder, as it is going to give them pleasure in hopping through the tunnels, 4-5 birds can feed at one time, as long as there is seed. Entry ports are from upper and lower sides, and are small, so larger birds don’t have access to the food, this gives smaller birds more seeds. The fly through bird feeder is designed for larger seeds like, sunflower seed and peanuts, to minimize waste don’t use small seeds, as even the bottom is made of mesh. The wide mesh do have a positive side, small birds can access the food easy, and the birds will like to feed on it. You can put a small platform under a feeder to gather the seed that falls down. 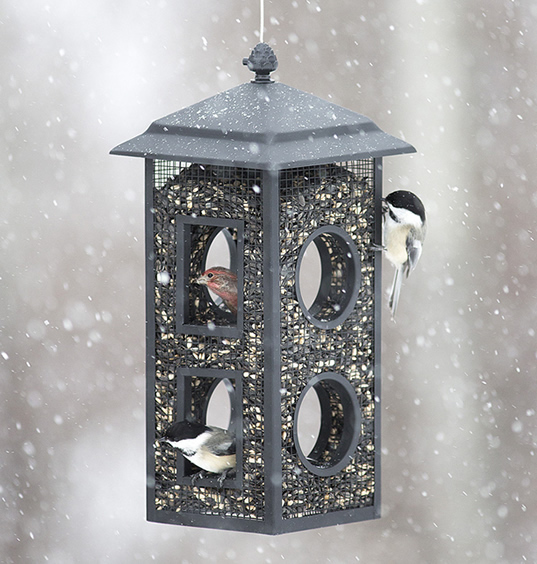 The feeder has a roof that is helping seed stay dry from rain, and snow, but as it is open design, the protection is minimal, so you can place the feeder on a place where it will have some more protection from water. The abundant air circulation through the feeding tunnels and mesh can help damp seed dry more quickly. The metal design is going to resist squirrels, but you should make more steps to repel them, like setting a squirrel buffle, chewing is not going to be the problem, but if they swing on the feeder, seeds will spill out. Clinging birds will like the setup, as there is lots of room to cling, but in the same time perching birds can enter the tunnels to feed inside, larger birds cannot get easy access because the design. It can make ones backyard flying with little birds in no time. Check Perky-Pet Fly Thru Metal Bird Feeder here.